Hi Friends: Today's post is Halloween tag using the Day of the Dead 2 stamp set from Tim Holtz. It's a spoof of a Halloween wedding. Please see below for photos, process, challenges, and supplies. Have a super day! I covered the manilla tag with black molding paste and used my spatula to create texture on the background. I added some Brushed Pewter paint in all the cracks and crevices in the textured molding paste. I added some cheesecloth to enhance the spider-web feel of the texture. I found some older white flowers in my stash and stamped them with a spider web and little spiders, then sprayed them with some LSG sprays to make them black and shimmery. I stamped the wedding couple image onto white cardstock with Jet Black Archival ink and fussy cut it. The flowers in her dress and bouquet were painted with some of the Nickel LSG spray. I layered the image onto the tag with foam dots, then arranged the flowers on the tag. 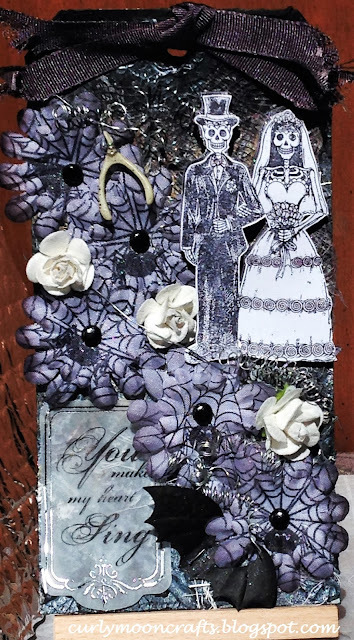 I found the vellum tag in my stash - it's black and silver and matched my Halloween Wedding theme, so I stapled it to the edge of the tag. I added some white flowers (tipped with the Nickel LSG spray) to balance out the white in the stamped image, then shaped some wire into spiral flowers and added them around the tag. I wrapped some wire around the wishbone and added it to the tag using more wire strips that I stapled throughout. I finished off with a black bat die-cut and some black ribbon - deliberately frayed to match the theme. Love your scary tag, amazing artwork.